Marvel Essential Captain America Volume 1: The Star-Spangled Avenger's Greatest Tales from the Mid-1960s! Marvel Essential Captain America Volume 1 reprints Captain America's stories from Tales of Suspense No. 59-99 as well as the first three issues of the newly-renamed Captain America series (No. 100-102). In addition to these 1960s tales, there is a bonus reprint from the early 1940s. 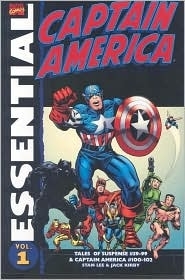 This volume collects Captain America's first ongoing series after the character was revived in the Avengers comic book. It's fun watching writer Stan Lee and artist Jack Kirby work to develop a theme and direction for the superhero in his own tales away from the superhero group. I highly recommend this volume to any fan of Captain America! The Marvel Essential series of books, each topping several hundred pages, contain the original stories in black & white rather than color. Sharing the Spotlight With Iron Man! Captain America received his own series starting in Tales of Suspense No. 59 in November 1964, sharing the comic book with a series starring Iron Man. Marvel Comics at the time was locked into a very restrictive distribution agreement that limited the number of books it could produce each month, leading to several `combo' comics. The two continued to share the book through issue No. 99. With issue No. 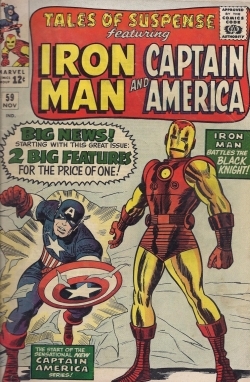 100, the book was renamed Captain America and Iron Man was sent off to star in his own comic. This comic is from my collection. I noticed on the protective bag that I paid $1.50 for it in the 1970s. On eBay there are copies going for several hundred dollars! Because of the shared arrangement, most of the Captain America stories in this volume are only 10 pages each, with many continuing over several issues. The other oddity is that starting with Tales of Suspense No. 70, Marvel alternated putting Captain America and Iron Man on the cover, so a good number of the covers reprinted in this volume don't have Captain America on them at all! Marvel Essential Captain America Vol. 1 - Buy it on Amazon today! Marvel Comics has reprinted most of its Marvel Essential series several times over the years, and some of them have different covers. I have heard that sometimes the reprints are tweaked or changed, but as far as I can tell that hasn't happened with this volume of Marvel Essential Captain America. Captain America Fighting the Nazis! Captain America's solo series started in the present day of the 1960s, but after four issues writer Stan Lee and artist Jack Kirby retold the superhero's origin in Tales of Suspense No. 63, a tale that occurs at the beginning of World War II and brings back Cap's teen sidekick Bucky. For the next eight issues, through No. 71, the tales take place in WWII and feature the heroes fighting the Nazis. These stories are much stronger than the first few of the series, because Lee and Kirby seem to be on surer footing. It's almost as if for the first few issues of the series they didn't really know what to do with Cap, but fighting the Nazis? Easy! 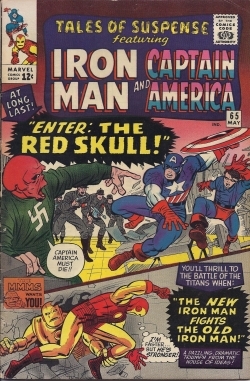 The highlight of the war issues is a four-part story that starts with the return of Captain America's arch-enemy the Red Skull in issue No. 65 and includes the villain's origin in issue No. 66. A Return to the 1960s! Nick Fury, SHIELD and the Black Panther! Starting with issue No. 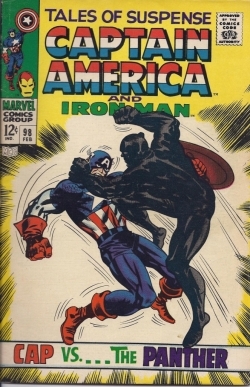 72, Marvel returned Captain America to the present-day 1960s (well, what was the present day at the time, of course!). The stories are much stronger now than the first ones of the series (Tales of Suspense No. 59-62) as Lee and Kirby get Captain America involved in adventures with SHIELD, Marvel Comics' super-secret spy agency headed by Nick Fury. They introduce a love interest in Sharon Carter, a SHIELD agent, and even bring the Red Skull back! The highlight of these stories is a four-part tale that guest-stars the Black Panther and culminates in Captain America No. 100. The story features a reappearance of Baron Zemo, a villain who had been killed in Avengers No. 15. The volume also includes a two-part story featuring the Red Skull's fourth Sleeper that originally appeared in Captain America No. 101-102. A Bonus Tale from the 1940s! The Terror That Was Devil's Island! The six-page story has Captain America and Bucky fight an evil Vichy warden who tortures his prisoners. The artwork is by Joe Simon, and it's interesting to see how much thinner Captain America was originally portrayed, and how young Bucky appears to be! 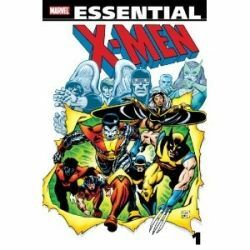 The Essential series reprints many of Marvel Comics' stories in large volumes that usually top several hundred pages. The series began in 1997 with the publication of the Essential X-Men No. 1 and The Essential Spider-Man No. 1. The big advantage of these books is cost: a reader can get 30 or more stories for the price of a half-dozen new comic books, and the old stories have more pages of action per issue. The Essential books are much more cost-effective than buying all the original comics as well. Some think the Essential series is a great way for fans to read all the adventures of their favorite characters without having to spend a lot of money. Others say the books aren't very good because the stories are reprinted in black & white on low-quality paper, so the pages look drab. I agree the colors are a major part of enjoying a comic, but I do think the Essential books are a great deal. I no longer have to go through my collection and pull the original comics out of their protective bags to enjoy the stories. Now, they can sit in a handy volume on my bookcase for me to tip into whenever I want! I think the Essential series is a great deal if all you are looking for is a lot of fun stories at a good price. I don't see the books as collectibles. For that, you'd have to hunt down the originals. I'd like to know what other comic-book fans think, so please take this poll. Also, give a reason for your opinion! Are The Marvel Essential Books Worthwhile? Yes! They are a great value! No! The original comics are the only way to go! Hard to say! 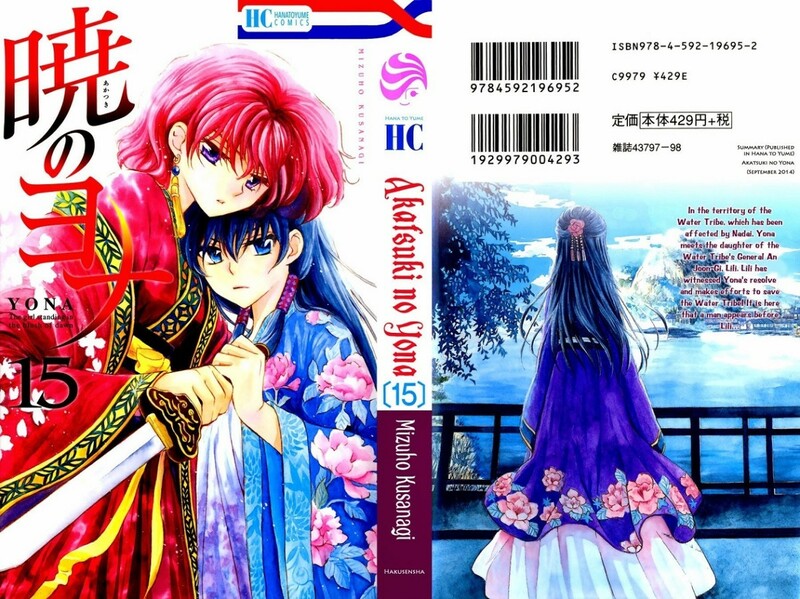 I like both these volumes AND the original comics! 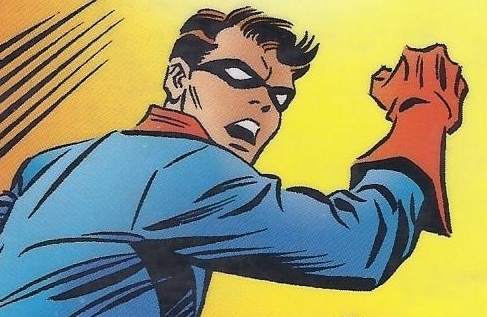 Kid sidekicks were very popular in the 1940s when Captain America debuted, with perhaps the most well-known one being Robin (junior partner to Batman). Captain America's sidekick was Bucky, a boy who stumbled upon the hero changing into costume and then teamed up with him to fight the Nazis. One of the biggest changes in the character of Captain America occurred during his revival in 1964. Writer Stan Lee had always said he didn't like the idea of young boys running around with the superheroes. So when Captain America was reintroduced the readers were told that Bucky had been killed on their very last mission during World War II. That had been the story for decades afterward, but in 2005 Marvel Comics revealed that Bucky hadn't died. He was reintroduced into the Marvel universe as a deadlier version of what Captain America might have been. Do You Think Marvel Should Have Revived Bucky? No Way! Once a character is killed he should stay dead! Sure, why not? Bucky adds another dimension to the Captain America stories! Wait a minute! They brought back Bucky? Tales of Suspense Comics on eBay! - Captain America, Iron Man and much more! Tales of Suspense debuted in 1959 as a science fiction suspense anthology comic. Iron Man's first appearance came in issue No. 39, and the superhero appeared in each issue through No. 99. A backup feature in issues No. 49-58 was ''Tales of the Watcher,'' in which the character from the Fantastic Four comics would introduce a story. After guest-starring with Iron Man in issue No. 58, Captain America began his solo series with No. 59 and the two superheros shared the comic for the rest of its existence. You can find copies of Tales of Suspense for sale on eBay. Please carefully note the condition of each book you are interested in, as well as all shipping and handling charges, so you won't be surprised by your purchase! The movie Captain America: The First Avenger, starring Chris Evans as the superhero, was released in 2011 and told the origin of the character. But the character first appeared on the Silver Screen in a 1944 serial, which changed Captain America's secret identity from a soldier to a district attorney and disregarded other elements of the comic book. Captain America was one of several Marvel Comics' superheroes to appear in a mid-1960s cartoon series and also was the hero of two TV-movies in 1979. Captain America Comics was a top-selling comic book from its introduction in 1940 until the late 1940s, when comics in general fell out of favor. Except for a short-lived revival in the 1950s, Captain America hadn't had a regular appearance in comic books until March 1964, when writer Stan Lee reintroduced him in the fourth issue of the Avengers. Avengers No. 4 is considered a key issue of what is known as the Silver Age of comics, and boasts one of the most easily recognized covers. The story has been reprinted in several Avengers collections, including the Marvel Masterworks and Marvel Essential series of books. The Marvel Masterworks series, reprinted in full color, may be the best way to read Captain America's revival if it's unknown to you. Fortunately, I have already reviewed the volume where the story appears. Check out this lens for more details! The Avengers Volume 1 was one of the first four collections when Marvel Comics began publishing its Marvel Masterworks series in 1987. If you are a fan of comic books then you should visit Geppi's Entertainment Museum in Baltimore. Founded by Stephen Geppi, president and chief executive officer of Diamond Comics Distributors, this place has one of the best comic-book collections on display anywhere! I wrote a separate lens on Geppi's that provides more details on the museum. Please check it out! Geppi's Entertainment Museum is located in Baltimore and is dedicated to all sorts of American pop culture: comic books, television, radio, movies, magazines and much more. Here's your chance to speak up about Captain America, the collection of comic-book stories, this lens or anything else you want to mention! What Do You Think of Captain America? - Here's Your Chance to Speak Up! I've watched "The First Avenger" a couple of times, and while I like it, I just can't get used to superheroes brandishing handguns. Don't get me wrong, I am a strong 2nd Amendment supporter, but it didn't feel quite right to me. I haven't seen "The Winter Soldier" yet, but it is getting a lot of good reviews, and I look forward to watching it soon. Captain America was a fascinating character. 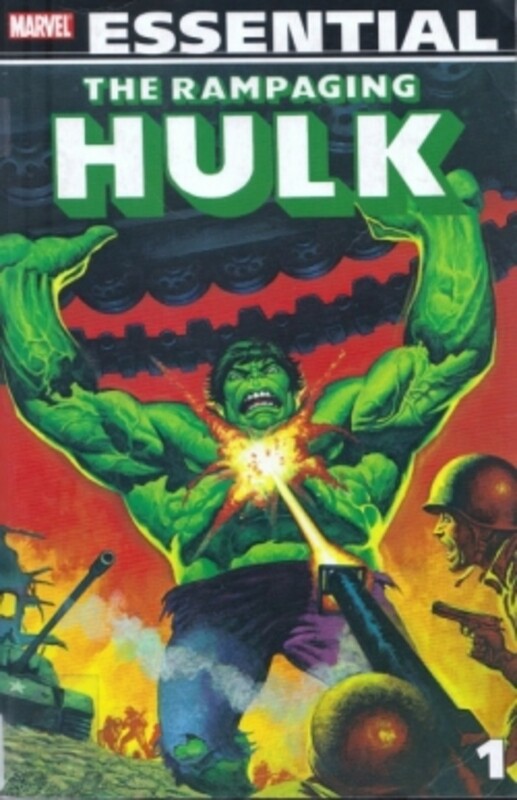 He didn't have the heavy duty power of Thor or Ironman or the Hulk but he always found a way to win. Superb lens! I love all Marvel Comic Books! Excellent lens! I am sure that Captain America fans love visiting your webpages. You guys really do have the comic book scene covered. Not a comic book fan, but this lens is interesting anyway! :-) Enjoyed the Avengers movie. Awesome lens! I love Marvel and looking up comic character history on Wikipedia. I have essential Ironman #1 and I love it!! Best Marvel character there is, Marvel's Superman. Love Captain America! Great lens! these classic Captain America comics are awesome. I've read lots of comic books when I was younger but didn't really know who Captain America was until the movie came out. Wow! He has been around a long time. The classic comics are amazing!!! I'd like to read the book, hi..lol!!! Great lens. Loved Cap as a kid. Was a bit disappointed in the movie. I guess I knew the story too well. I'm very excited for the Avenger's movie though.